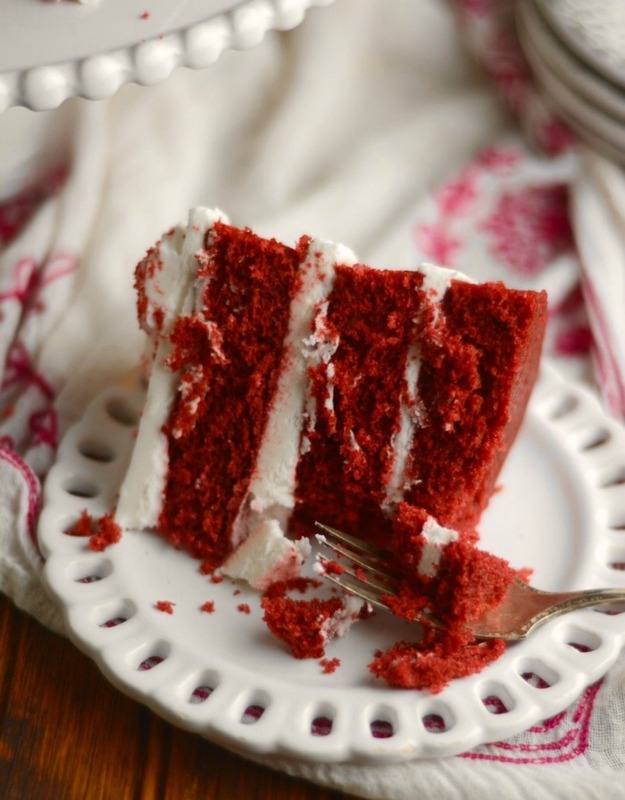 I often think of red velvet cake as a Southern-based recipe. Come on… you remember the red armadillo cake from Sweet Magnolias, don’t you? The groom’s cake was in the shape of an armadillo. And when you cut into it, it showed blood red. Make a paste of cocoa and red food coloring; add to creamed mixture. Mix salt, 1 teaspoon vanilla, and buttermilk together. Add the flour to the batter, alternating with the buttermilk mixture, mixing just until incorporated. Mix soda and vinegar and gently fold into cake batter. Pour into 3 round greased cake pans and bake for 25 minutes on 325. In a mixer blend together butter and cream cheese. Mix in sugar and vanilla. Blend until creamy and smooth. Spread over your Red Velvet cake. 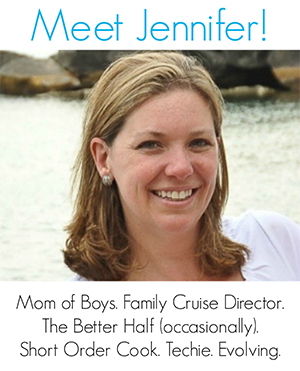 Find 100+ more inspiring recipes on Mommy Evolution! Beat shortening and 1½ cups sugar until very light and fluffy. Add eggs and beat well. Make a paste of cocoa and red food coloring; add to creamed mixture. Mix salt, 1 teaspoon vanilla, and buttermilk together. Add the flour to the batter, alternating with the buttermilk mixture, mixing just until incorporated. Mix soda and vinegar and gently fold into cake batter. In a mixer blend together butter and cream cheese. Mix in sugar and vanilla. Spread over your Red Velvet cake. Will have to make this for Valentine’s Day. Red Velvet is the hubs’ favorite!!! Red velvet cake (or cupcakes) is my favorite as far a cakes go. This recipe looks like it doesn’t disappoint…moist and delicious! Thanks! Pinned! Oh my goodness! That looks so deliciously deadly! I am glad I am not the only one that thinks of the armadillo cake when I see red velvet cake. Thanks for sharing on the Creative K Kids Linky Party this week. I hope you will join us again next week. This looks absolutely to die for! 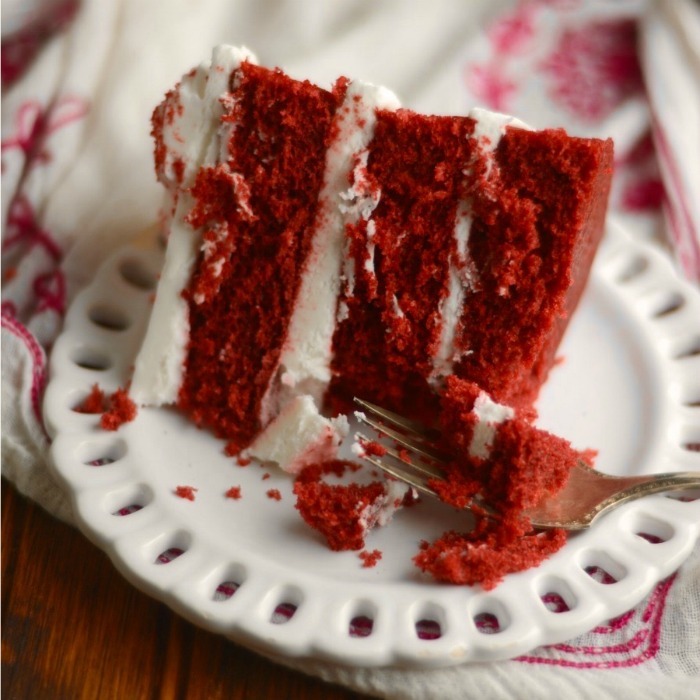 There is NOTHING better than a moist red velvet cake. YUM! This cake looks gorgeous and Thanks for bringing this by Throwback Thursday! This indeed looks the best red velvet cake!! Thanks for sharing! It would be fitting that this cake’s origins come from the Woldorf! I love red velvet cake and the red velvet cheesecake is the only thing I eat from Cheesecake Factory too. Thanks for linking up with us at #OMHGWW! 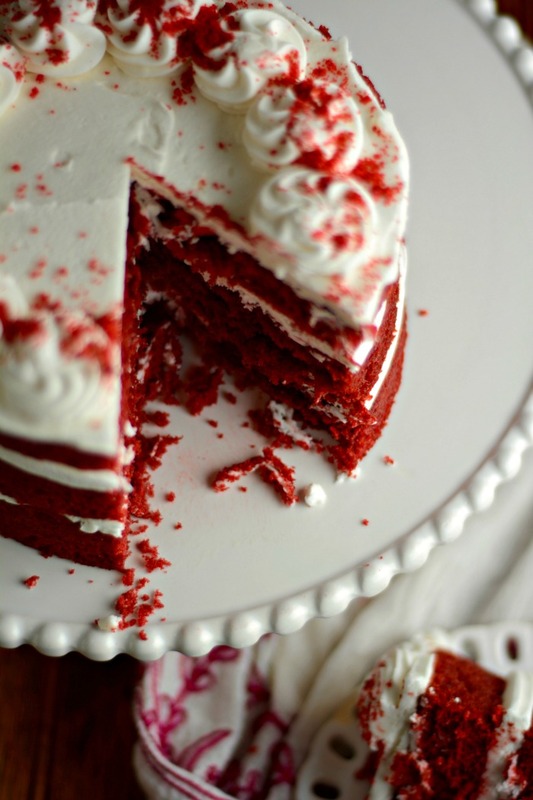 We love a Red Velvet Cake, this looks delicious! Hope you are having a great week and thanks so much for sharing your awesome recipe with us at Full Plate Thursday!